Video on demand or decoder-based entertainment? We explore whether video streaming services are the answer to expensive decoder-based viewing. Spoiler alert: it's complicated. It’s a question anyone who has subscribed to a premium TV package at nearly eight hundred bucks a month has asked themselves at some point: Am I paying too much to watch TV? And with the emergence of a whole smorgasbord of digital streaming options in the country, from Netflix to ShowMax to whatever our blessed cellular providers are doing in that space these days, it’s a fair question. The answer is quite complex, but ultimately it comes down to what you want to watch. If your thing is primarily TV series, documentaries and movies, you have quite a few options that aren’t the obvious one in the large number of streaming services available online. If you like sports, you’re out of luck – there really is only one option, and it’s the expensive one. Sorry. But if you have a fast internet connection – say, 20mbps+ ADSL or fibre – sufficient data, and you are a movie and TV series watcher, you’re sorted. Access to streaming services is only limited by whether or not they’ve available in South Africa; in cases where they’re not, it’s only your familiarity with and comfort around Virtual Private Network (VPN) services that stands in your way. The answer to whether you’re paying too much, then, boils down to cost over time. So to find that out, let’s look at the options, starting with a general idea of how much the traditional option costs. At R789 a month for the most expensive local TV option, you’ll spend R9468 for the year; more if you still need to buy the decoder and have it installed. Assuming you have nothing, you will need to spend that R9468 plus about another two grand to get the decoder and have it installed. And you’re going to want that “most expensive” option, because the other, cheaper ones are nowhere near as content-rich. Streaming, meanwhile, costs as much as your internet connection does added to the monthly fee of your chosen streaming service. A Netflix Standard account, which allows for HD streaming and watching on up to two devices, will cost around R130 a month. While we’ve included the cost of internet access in the comparison for illustrative purposes, South African households tend not to have one or the other – they have both. Internet connectivity is thus not an extra cost to take into consideration when evaluating the benefits of streaming services. 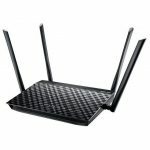 The four components of any streaming solution are a TV, a device on which to stream your content, a router, and your internet connection. More recent TVs have apps for Netflix and other popular streaming services, but many don’t, thus we’re including the cost of a streaming device. The ASUS VivoStick TS 10 is a great option as a streaming device, as it’s small enough to simply plug into an available HDMI port on any recently-made TV, it has built-in AC-class Wi-Fi plus its Atom x5 processor is powerful enough to stream 1080p video content without breaking a sweat. It’s also a full-blown Windows 10 PC, which has benefits that go beyond “mere” streaming like web surfing, email and casual gaming. 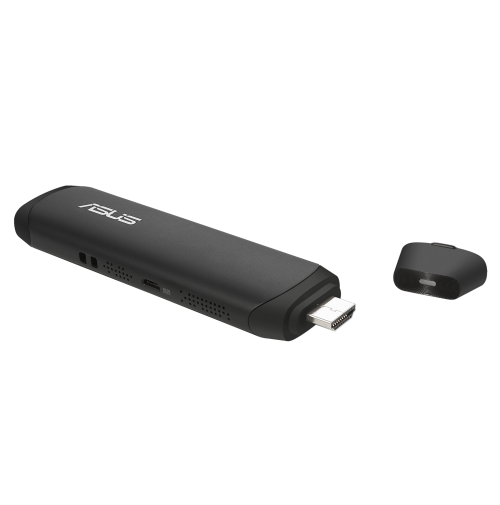 This is for a $9.99 Netflix Standard account (roughly R130 at today’s exchange rate), an entry-level 1080p streaming device – the ASUS PC Stick – and ASUS’s fibre-ready and AC-class RT-AC1200G+ router (pictured left). For connectivity, we’ve gone with a 20mbps down/2mbps up capped fibre account from Telkom, as recommended under the “Best for Movies” section of a local ISP’s fibre packages page. 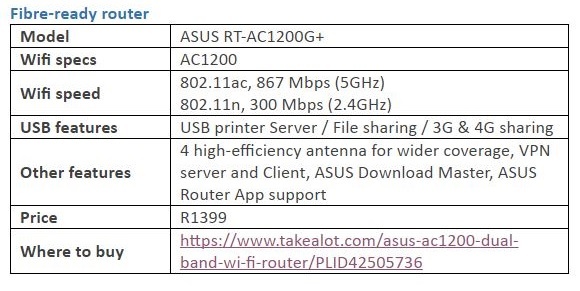 On the basis of that dramatic R7908 saving, it’s unsurprising that people are tempted to dump traditional TV options altogether and just scoot over to a streaming setup. Streaming is not just cheaper, it can also deliver better image quality. 1080p video is much cleaner-looking than 720p and 1080i HD, and miles crisper than the awful 540p images what we used to watch back in the days when TVs were square and weighed the same as a small car. But even 1080p video doesn’t look amazing, especially when watched on any TV bigger than 40 inches. And that’s where 4K content comes in. It’s four times the resolution of 1080p, and of course it’s crisper, sharper, and looks so much more realistic as a result. But no TV provider in the country offers 4K content, partly because we don’t yet have enough 4K TVs in South African households to justify it and partly because the wireless spectrum to deliver it is currently occupied. But 4K viewing options are definitely available online: in addition to video-sharing sites like YouTube that offer 4K content, many paid-for video-on-demand services offer the ability to stream their content in 4K. Netflix is one of them. The only catch is you need to pay for a Premium account, which costs $11.99, or about R154, a month. Yes, R154 per month gets you TV shows and movies in 4K which you can stream to on up to four devices, whereas almost R800 gets you a mix of 1080i (not even p) and standard-definition content. Of course, 4K video being four times the resolution of 1080p content means playing it requires plenty of bandwidth, a TV capable of displaying it and a device with sufficient processing power to decode it without overheating or falling over. For that reason, it’s wise to use something like a mini PC – a full-on desktop PC that fits into a small case – to stream 4K content. Something like the ASUS VivoMini UH45A will do the trick: it’s very compact, yet rocks an Intel graphics chip capable of stutter-free 4K video decoding. 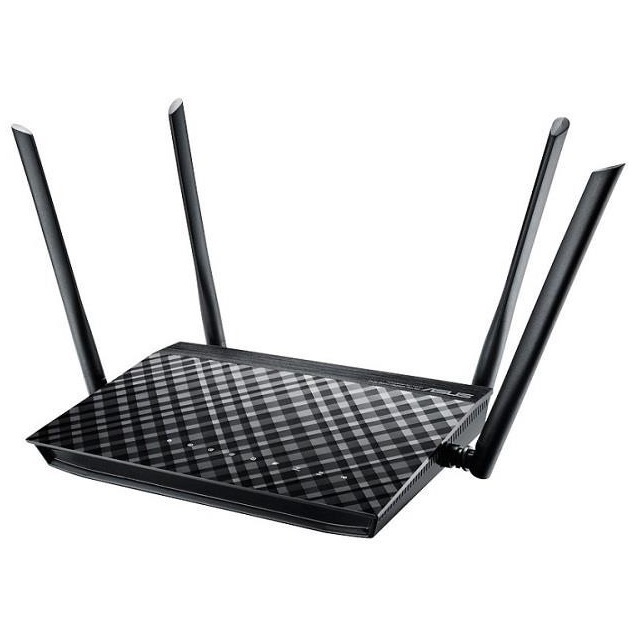 It can also be used as a regular PC when you’re not streaming video, which a decoder just can’t. 4K is why we recommend a 20mbps down, 2mbps up fibre connection – that’s fast enough to stream it (according to Netflix’s CEO), yet not so expensive that it makes the idea unattractive. Just watch your data cap, as 4K video is bandwidth-intensive and will chew through 100GB very quickly; maybe consider an uncapped line for an extra few hundred bucks a month if your dream is watching 4K TV shows at home. Of course, there’s more to consider than just cost and video quality. Locally-available streaming services are notorious for not including the very latest episodes of popular TV shows, or not carrying them at all. This is usually down to how TV show and movie licensing works, and sadly, it’s a problem that’s not going away anytime soon. No matter how many streaming services make themselves available in South Africa, if there’s a show that another company – say, an established broadcaster – has bought the exclusive rights to, it’s not going to appear on any locally-available streaming service. And those bigger players can do that, because they have more money. Licensing content is expensive. It’s for this reason that the very latest episodes of shows like Jessica Jones, Daredevil, House of Cards and Orange is the New Black and Game of Thrones don’t appear anywhere else but on one specific service locally. Sure, they hit other streaming services eventually, but only months after they aired in the US, and that’s not ideal. This is also why locals used to purchase VPN subscriptions that fooled Netflix into believing they were located in the US. Netflix has wised up to this, and locked its service down in such a way that even the slickest VPN services can no longer fool it into granting access to anyone but Americans. In response to the clear interest from TV watchers in other nations, Netflix made itself legally available in many countries, but this didn’t actually solve the problem as its localised libraries couldn’t include those high-profile shows and movies due to licensing. Just what is the difference between Netflix US and Netflix SA? According to finder.com, “93% of titles available on Netflix in the US are NOT available in South Africa”. But don’t take that to be a really awful statistic; it just means a lot of the fluff on US Netflix isn’t available locally, and our list of shows and movies are likely highly curated to ensure the best of the bunch are available to watch her… just without those top shows and movies bought by other providers. The news isn’t fantastic for people who want to stream their entertainment and watch the very latest shows shortly after they air in the US, because to do that requires that you sign up for that sub-R800-a-month service as that company owns the rights to air most of those shows in South Africa. And VPNs no longer grant unfettered access to US Netflix due to the company’s tightening of its policies, so that workaround is no longer an option. Should you not absolutely have to see the latest shows hours after they air in the US, on the other hand, streaming older shows and movies via locally-available streaming services is a good option, as it’s far cheaper than paying nigh-on R800 a month. Netflix SA is likely a good choice at R130pm, as is ShowMax as it charges just R99 a month for access to its entire library. Ultimately, video streaming services are not a replacement for mainstream TV services. They can’t be, because they don’t offer the very latest episodes of the biggest TV shows. Not because they don’t want to, but because the biggest players (with their deeper pockets) tend to snap those up. What they are, is a replacement of your local video store; for the price of renting three DVDs or Blu-rays for just two days, you get access to an entire library of content for a full month. Until the licensing models of the big studios change, sadly, this is how things will remain. Are streaming services still worth the money? Absolutely, because they are cheap and 1080p and 4K streamed over some sort of playback device looks fantastic. Just don’t expect to see Game of Thrones Season 7 Episode 1 on them hours (or even weeks) after their US debut, and you’ll be fine. All of the ASUS products mentioned above are distributed by Tarsus Distribution. For more information, contact your account manager or call 011 531 1000.